Ensuring a high-quality teaching force is one of the most important things that school districts can do to raise student achievement. In many districts, however, high-poverty schools and those that primarily serve black and brown students have experienced inequitable patterns of access to strong, high-quality teachers. “Achieving Equitable Access to Strong Teachers: A Guide For District Leaders” shares lessons learned from districts across the country on how to begin the work of changing these patterns, and lays out a process that other districts can replicate to ensure that low-incomes students and students of color have the opportunity to be taught by effective teachers throughout their schooling. 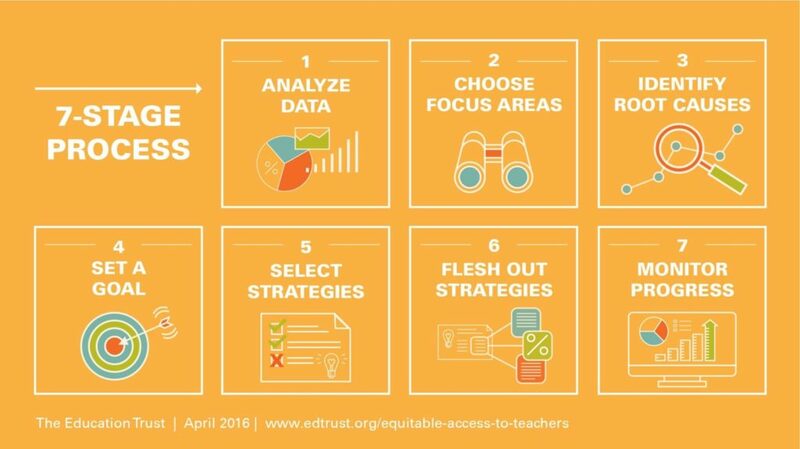 The guide’s seven-stage process, with each stage building upon previous ones, is intended to help district leaders explore underlying causes that contribute to inequities, set equity-oriented goals, and develop strategies to ensure equitable access to effective teachers throughout our nation’s school systems.